Get it while it's green! Buffelgrass (Pennisetum ciliare) is a perennial grass invasive to the Sonoran Desert that threatens desert ecosystems by out-competing native species and altering fire regimes. 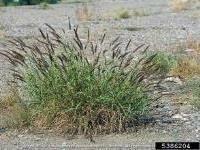 Managers have concluded that efforts to eradicate buffelgrass must include application of herbicide, which is only effetive if applied when the buffelgrass is green. We would like to monitor certain patches of buffelgrass for it's phenology, without pulling it, to determine when it is most susceptible to herbicide applications. Information will be provided to local land managers, such as representatives for Saguaro National Park, to help with decision-making processes. We need volunteers to sign up as observers with Nature's Notebook and "adopt" a location for weekly observations from now through the fall season. 1. Find a site to monitor buffelgrass - Choose a location that you will visit at least once per week through the end of the fall. If you have another site at which you know there is buffelgrass, email groups@usanpn.org to ask about adding it to the network. 2. Sign up as an observer - Become an official participant with Nature's Notebook and set your username and password. All you need is an email address and Internet access. 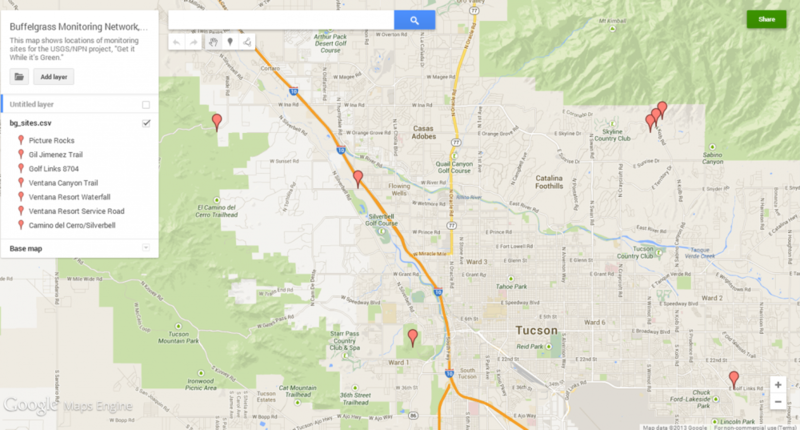 When you are registering, identify yourself as a part of this effort by selecting 'Buffelgrass Monitoring Network, Tucson' from the 'Partner Organization' drop-down menu. 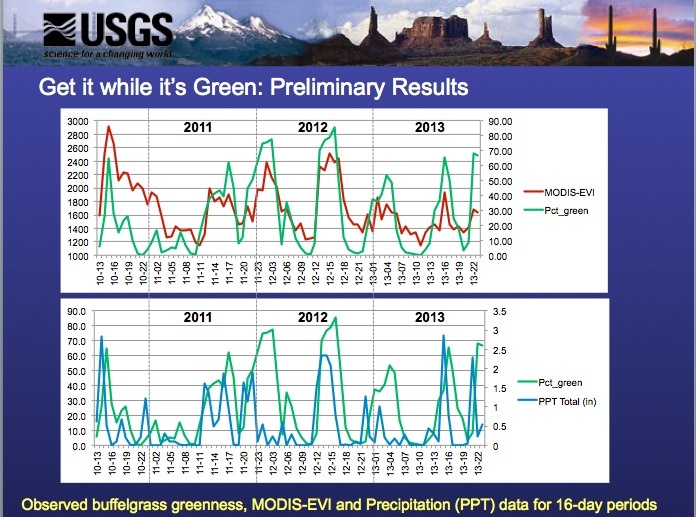 The percentage of green leaves for buffelgrass, recorded in the abundance and intensity bins described on the buffelgrass phenophase definition sheet (What percentage of the plant is green?). You can also include a more sepcific number in the comments section of your data sheet. 4. Report your observations - As you collect data during the season, log in to your Nature's Notebook account and enter the observation data you recorded. You can also download and use our Mobile Apps for Android (Google Play Store) or Apple (iTunes Store) devices AFTER you have set up your Nature's Notebook account on a desktop or a laptop. More details on the specifics of observing plants and animals with Nature's Notebook. We can see from this graph that the on the ground observations made by our team closely reflect the satellite imagery (top graph) and the green up following a precipitation event (bottom graph). Having more data will enable us to further understand these correlations and help us to make recommendation to local land managers on how to best treat and abate this invasive.